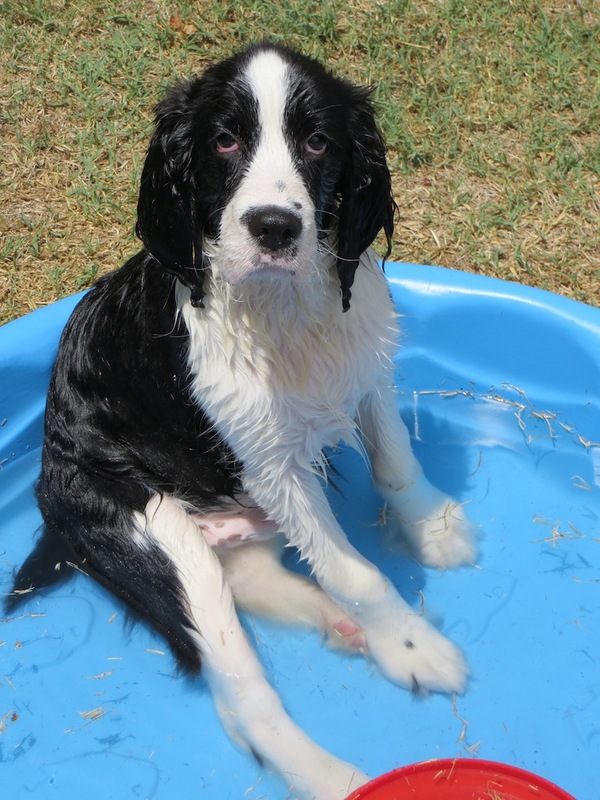 Being an English Springer Spaniel puppy can be tough, so sometimes you just need to relax in your own private pool. This is exactly what William did today to beat the heat. You would not believe how hard it is to find plastic kiddie pools. My husband and I searched for this last week and ended up going to several places, including two Toys R' Us stores before locating this incredible pool for the amazing price of $7.99. Last week we had extreme heat and humidity, so perhaps that explains the shortage of kiddie pools in our area. These picture demonstrate some of William's calmer moments in the pool. English Springer Spaniels are water dogs and naturally take to being in the water. William needed a little coaxing to get his feet wet so to speak, but once in the pool he really enjoyed splashing around and trying to paw at the plastic fish at the bottom. Below is an action shot taken earlier of William running through the sprinkler like a madman.